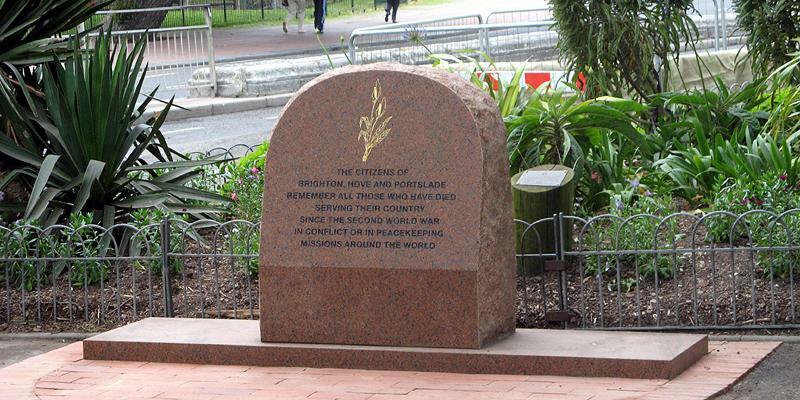 "THE CITIZENS OF BRIGHTON, HOVE AND PORTSLADE REMEMBER ALL THOSE WHO HAVE DIED SERVING THEIR COUNTRY SINCE THE SECOND WORLD WAR IN CONFLICT OR IN PEACEKEEPING MISSIONS AROUND THE WORLD." Three war memorials grace the northern enclosure of Brighton’s Old Steine – the Egyptian Memorial, the Brighton War Memorial and a new one that is yet to be named officially (from which the above wording is taken). 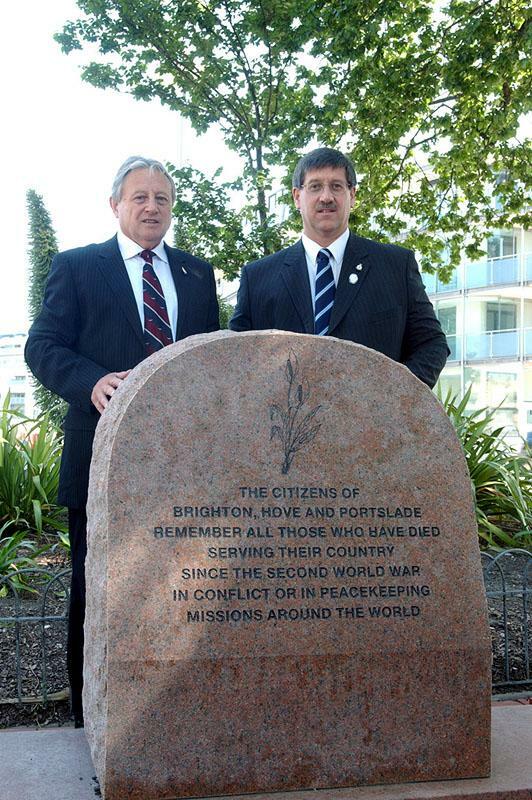 To mark the 25th anniversary of the Falklands War, a local campaign was run calling for the addition of Corporal Steve Prior’s name to the Brighton War Memorial. Corporal Prior died in the Falklands aged 29 in 1982 while serving with the 2ND Battalion of the Parachute Regiment. Although a plaque on the Brighton War Memorial does in fact commemorate those who died in conflicts after the First World War, the structure is specifically Listed as a World War I monument so adding extra names was simply not feasible. A new memorial was proposed by Councillors Brian Oxley (the then Council Leader of the Council) and Steve Harmer-Strange (a Falklands veteran himself) as a tribute to all of those who have died in conflicts since the Second World War. It was made by a local stonemason, Jeremy Tilley, who sourced an appropriate single piece of pink granite to match the adjacent Egyptian Memorial. The unveiling on Veterans’ Day this year (27th June) was made extra special by the presence of Bob Prior (pictured with Cllr Harmer-Strange), the brother of Corporal Prior. The Egyptian Memorial of the 1ST Battalion, Royal Sussex Regiment, is a pink granite obelisk with a list of the names of those who died in the Egyptian campaign of 1882 and the Nile Expedition of 1884-5. It was erected in 1888 and is now Grade II Listed. The Brighton War Memorial was unveiled in 1922 and specifically commemorates those who died in the First World War. The statue of George IV that is now outside the Royal Pavilion’s North Gate was relocated to make way for it. It was designed by Sir John Simpson and takes the form of a tranquil Roman water garden. Although its pylons record the names of 3 women and over 2,000 men, it is known to be the case that not all of those who fell are listed. This year’s Remembrance Sunday fell on 9th November and Armistice Day – always on 11th November – saw its 90th anniversary.